Brother-in-law, Tom, bicycle repair artist, two-wheel tinker and enthusiast wrote us out of the blue « I’ve bicyled on every continent but never in the heart of Africa. I’m coming to TL2. What are the conditions? I’ll build you bikes and we will go together ». And so the TL2 bike tour was born. 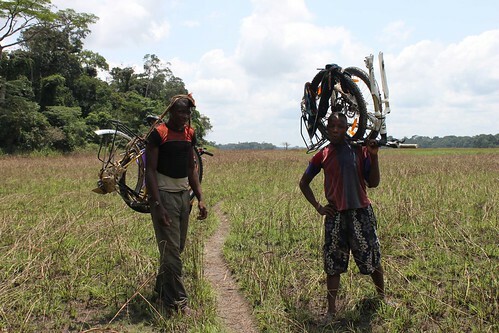 Two sturdy, three-speed bicycles were transferred to Kindu. 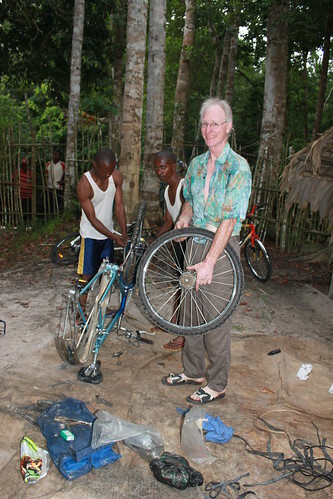 Tom putting bikes back together after the walk to Camp Katopa. 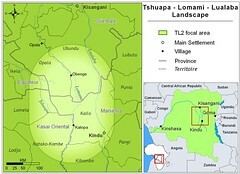 Germany is going to contribute to the creation of the Lomami National Park. 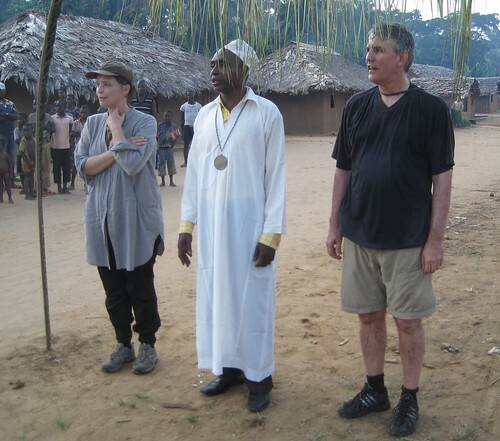 Because of that the German ambassador accompanied by the head of German’s environmental aid organization, GIZ, wanted to visit; the only time they had available was when Tom was already on site. 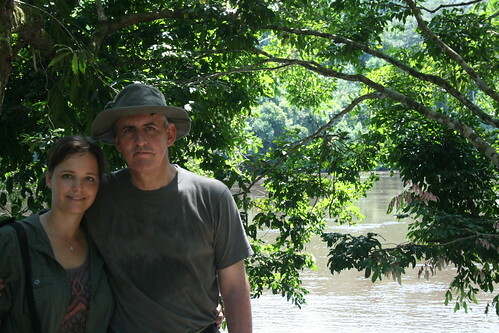 Ambassador Peter and his wife Sabine at camp Katopa on the banks of the Lomami. The provincial government insisted that someone from the army, the secret service (ANR) and internal security (DGM) accompany the ambassador — on bicyles, of course. 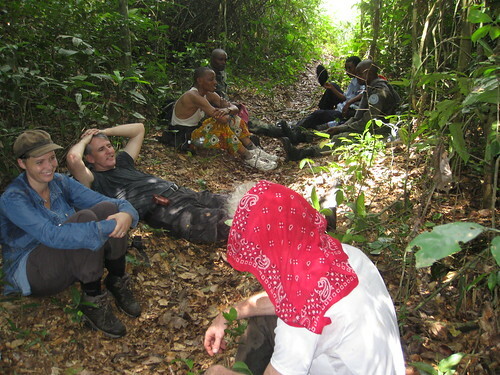 The security detail is at least as exhausted as Peter and Sabine at a rest point on day 4. This would be over 350 km without hotel, no telephone network, no air-strip, not even a medical clinic. How to prepare? More porters had to be found for every leg of the trip; At every campsite we dug two outhouses and put up two shower shelters — the ambassador is bringing his wife as well! A bucket bath by head lamp in the shower stall — photo by Sabine. In the end, we learned something of what it means to be diplomat. We learned that diplomatic communication takes precedence over exhaustion and hunger. We learned that diplomacy is a skin not easily shed. This is a map of the southern part of the TL2 landscape. Blue is travel by dugout, red by bicycle and yellow on foot. Day one. 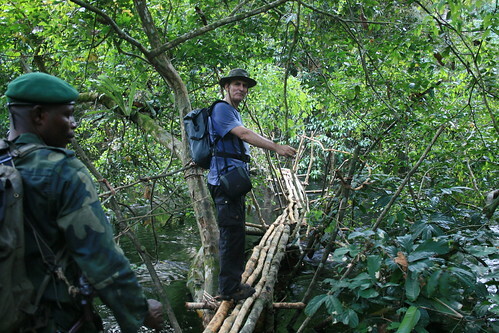 Three dugouts lashed together take delegation downriver from Kindu to Lokando. Ministers, Coordinators, and assembly members at close quarters over the roar of the motor. 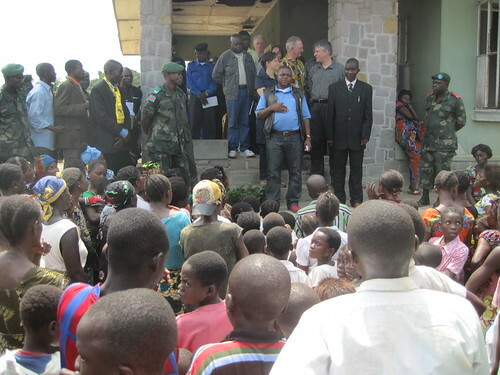 At Lokando, all authorities had a word with the population, and the ambassador talked about the priority of saving the forest with its animals. Speeches are made before a gathering at Lokando, then smaller discussions over dinner. Day two. The peloton launches. After fifty kilometers by bicycle, we feel we have our wheels under us. 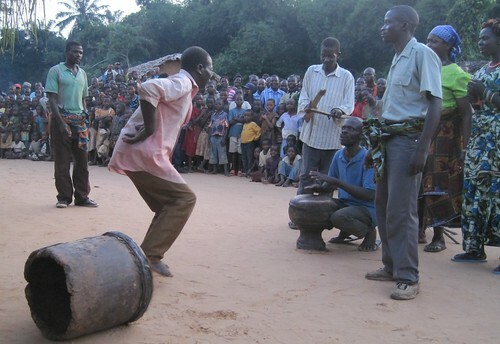 We are greeted with music at lunch in Kakonga and with more music in the evening at Tshombe Kilima. 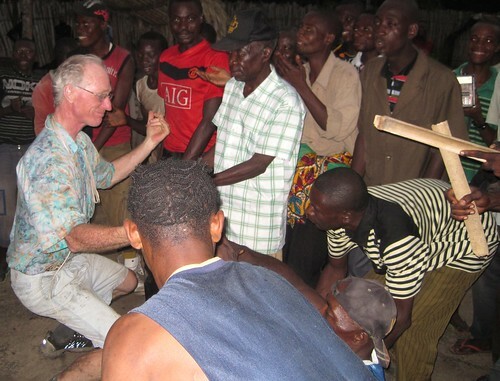 The ambassador holds his first village meeting with the chiefs from surrounding villages. Tom dances with the drummers and singers. The ambassador is in a village meeting. Day three: The bikes are taken apart and ready to be carried but we are delayed by the flooded Nyamatindi river on the edge of the village. They build a raft. It ends up ferrying us – the women – and all the rations, tents etc. The guys strip and swim. A cool beginning to the first day of walking and the tone is set for the rest of the trip..
Sabine is first across on the flimsy raft. The ambassador starts across the flooded Luidjo on a bridge of vines and poles. The flooded Luidjo goes on and on until finally …almost dry land. 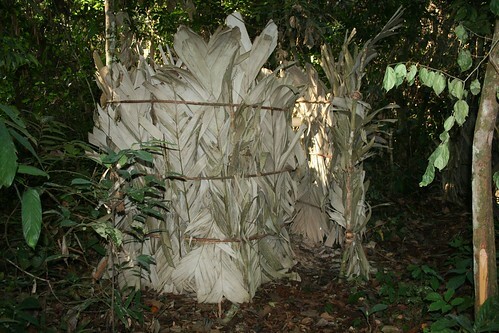 Day four: We walk in forest and then in savnna and more forest and finally arrive on the banks of the Lomami. We call across to our Camp Katopa and they send a dugout to get us. 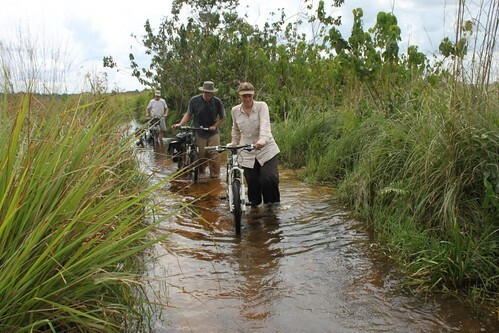 Across flood, forest and savanna, each of our bikes is being carried. Day five: We spend in camp. Putting the bicycles back together and visiting the rapids up stream where artisanal fishermen work during the season of floods. 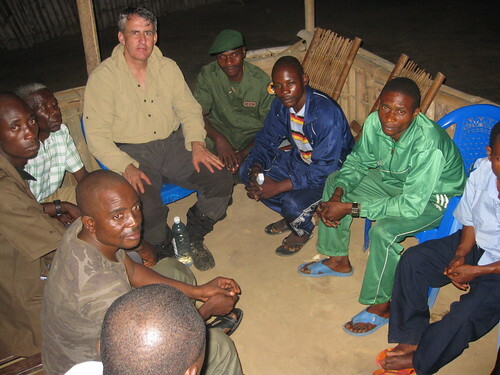 From late in the afternoon and on into the night, the ambassador met with villagers. Day six: Is a lovely bike ride along forest paths to finally end up at the village of Kahodi. Two sectors and the territory of Katako Kombe are all gathered to meet the ambassador. Meetings start over goat meat and chicken, continue late into the night and start again the next morning as we wait out a heavy rain. Just off the bike and in reception mode. Several dance troops compete for our benefit in Kahodi..
Day seven: Luckily this was the shortest day, we weren’t on our bikes until close to 11 AM, and then we had to negotiate rain-slick clay. 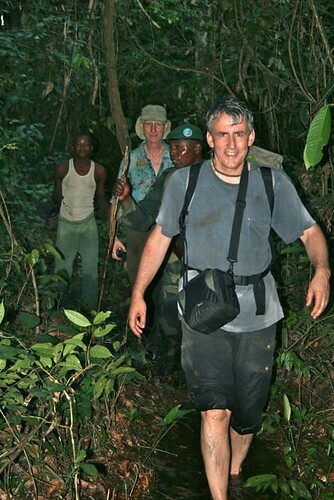 We crossed back to the east side of the Lomami, and then had our longest 20 km savanna to cross. Thank goodness the sky was overcast. The views were magnificent. 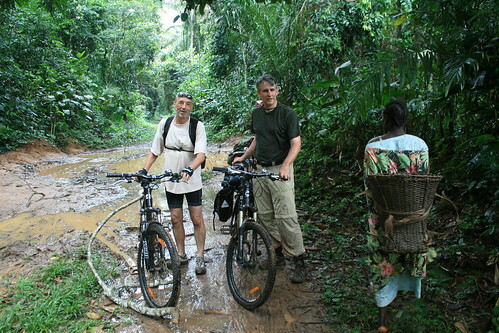 Pushing the bikes over the slippery clay road east of Kahodi. Day eight: We have more water to cross than any other day. Flooded savannas and flooded streams have little patches of dry land in between. The idea of dry shoes was left behind long ago. But the ambassador was ready to salute and hold meetings when we arrived wet and hungry at Olangate. Day nine: We line up for a group shot in the morning. 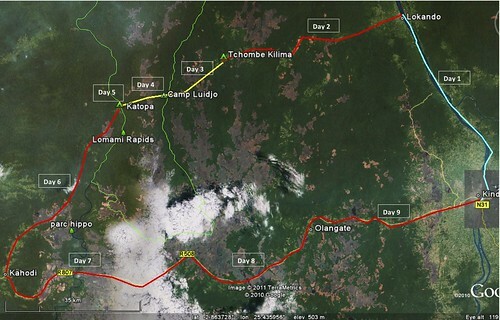 Then we cover the last 50 km to Kindu. Our resourceful Chef de Peloton, Crispin, is on the far left. What will be the upshot of the ambassador’s trip? And at some level there is a better understanding among the chiefs of just how important their protection of their forest is to the rest of the world. Maybe next year the peloton will do the north. This entry was written by Terese Hart, posted on 2011-03-16 at 10:08 pm, filed under About the project. Bookmark the permalink. Follow any comments here with the RSS feed for this post. Post a comment or leave a trackback: Trackback URL. Wonderful post Terry…I posted it on FB–George Ann agrees..
Wow, what an amazing adventure! I have to admit – I am more than a wee bit jealous. It is a pleasure to put your post together with uncle Tom’s account and the pictures. So amazing! Thanks for the post! Congrats, what a great, fun and delicious story. Keep us updated. Would like to get a ‘most western’ western hemisphere contingency group from Utah on board- perhaps initially with fund raising? Perhaps joining the peloton some day? Some year? What a great story! Tom can be my ambassador anytime. this is amazing to read/see Terese. Congratulations to you both for pulling this off. It’s great to know such events are feasible in the interior — this would have been impossible 6 to 10 years ago. I loved the post about the ambassador and wife. Are they posted in Kin and does he speak any Swahili or Lingala? It looks as if they really got into it. But what a feat to pull off!